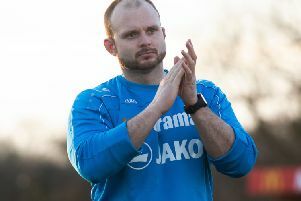 Hemel Town manager Dean Brennan has admitted that his side were ‘outclassed’ by promotion-chasing Whitehawk on Saturday. Hemel went into the game with nothing but pride to play for, and it was Whitehawk who emerged as deserved 3-1 victors to clinch a place in the Conference South playoffs. “Saturday’s game showed us everything we knew about the squad already, everything we already knew about the players,” said Brennan. “We were outclassed by Whitehawk – their midfield was excellent and up front they caused us problems which is why they’re in the position that they are in and we are in the position that we are. “The better side won, it’s that simple and we have no qualms about it. They have that bit more experience than us and our midfield three couldn’t cope with their midfield two. We’ll be making serious changes in the summer to rebuild a new team, just like we did this year. The Tudors finish their league campaign at home against Eastbourne Borough on Saturday afternoon, and Brennan says that his thoughts are already on shaping the squad for next season. “I’ll now be looking to start building the team for next year,” said the Tudors boss. “We were using the game on Saturday as a trial for some of our players for next season and it was down to them to take the opportunity. “I understand that we’ve got a young squad and I understand the need to develop the team. People keep telling me it’s been a successful season, but it hasn’t – far from it. “You’re only successful if you win trophies and, not being disrespectful to the Herts Senior Cup, it’s a nice little trophy but it was far from the top of my list of priorities. He added: “We’ll be making serious changes in the summer to rebuild a new team, just like we did this year, and the summer before last when we built a team to win the Southern Premier title. “We look at Bromley, with over 3,000 fans jumping around and celebrating the title – that’s what want to see at Hemel. They are the kind of occasions we are looking to achieve at this football club.